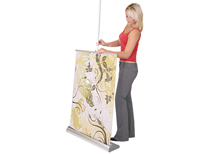 Orient banner stands have been one of the most popular banner stands for years. The stylish base looks very professional, but does not take focus off the graphic. The base is about 8" deep making it very stable without requiring twist out legs. Hardware is available in silver or black so you can match the color theme in your booth. 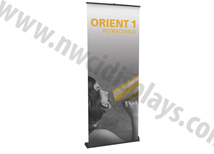 Orient banners come with a lifetime warranty on the hardware and a 6 month warranty on the graphic. 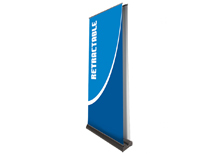 Anti-curl vinyl is included with every banner kit as our standard print. We only offer premium vinyl products so every customer receives a high quality product at an affordable price! 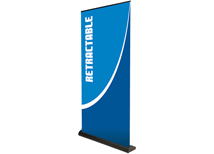 Size - 31.5" x 83.25"
Size - 33.5" x 83.25"
Size - 35.5" x 83.25"
Size - 39.25" x 83.25"
Orient banner stands are manufactured by Orbus Company in IL. 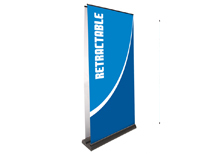 They have a proven track record of reliability over long periods of time. 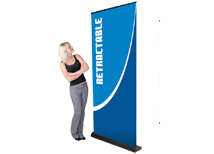 We now offer anti-curl vinyl as the standard print on every banner stand so the graphic will last just as long as the hardware. 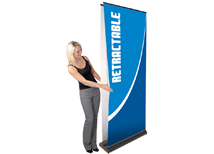 We offer a full line of pull up banners, but customers continue to come back to the Orient because of the great value it offers. Turnaround time is only 3 business days and expedited shipping is available for customers on a tight time line.